She came, she saw, she left again and, in between, the usual crowd of hangers on and supposedly intelligent people reduced themselves to the babblings of fools and morons. The occasion could be none other than a visit by Elizabeth Windsor (or the Queen, Her Majesty or HRH as she is quaintly known among respectable circles of invariably university-educated people) to her Irish colony. As ever, the ‘royal visit’ failed to disappoint in the levels of high farce and pathetic slavishness for which these occasions are renowned. Compliant members of the public were produced, curtsies were pulled and miles of mindless coverage was relayed over the course of days by the corporate media. One BBC Radio (part of) Ulster reporter apologised on air after he wrongly described the colour of Windsor’s clothing at an official ceremony; a live debate then followed and listeners were offered the opportunity to phone in and give their opinions on the weighty matter at hand. None did. Later in the week, a row erupted when a senior member of the Irish rugby team supposedly failed to show the adequate amount of “respect” when meeting the matriarch of England’s foremost family of spongers. Ever the sensitive ones when it comes to issues concerning their majesty, the DUP even went so far as to demand that rules on etiquette be released for future encounters after Irish international Ronan O’Gara appeared “too relaxed” when talking to Windsor. 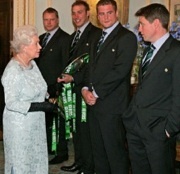 Presumably, O’Gara should have appeared suitably awe-struck or just plain terrified. So at least Mr Bowe was born in a British hospital and played for a British team and must owe a smidgen of loyalty to the English monarch, even if he is from across the frontier in Ireland. Windsor’s illustrious other half, Philip, was in equally fine form when he was dispatched to do what he doubtless does best - laugh and fool around with human rights abusers. Mr Windsor (or should that be Sir?) was in north Down at a ‘rehabilitation centre’ for former RUC officers, a venue where his notoriously racist jokes would probably have went down quite well. Behind all the playacting, however, there was also a serious aspect to the Windsors’ latest sojourn in occupied Ireland. Firstly, the British occupation must be normalised. Frequent visits from the “sovereign” where hospitals and schools are visited, children present flowers and local dignitaries line up to bow are a perfect way to help that process. The massive operations mounted by the PSNI and other British security agencies to facilitate such visits can be camouflaged behind media images of the English monarchy’s universal popularity. Presentations to the all-Ireland rugby team and the dutiful presence of Twenty-Six County president Mary McAleese by Windsor’s side during her stay point to another development of recent times - the concept of the Twenty-Six County state returning to the British Commonwealth. Of late, right-wing politicians, journalists and pro-British lobbyists have been attempting to force the idea of Ireland as a whole returning to the British fold into mainstream thought. In November last year, Twenty-Six County defence minister Willie O’Dea attended a Royal British Legion ceremony for the Empire’s war dead, other ostensibly nationalist politicians have donned poppies, while it has been muted that Ireland maintaining formal ties with the British state is the price to be paid for reunification at some unspecified future date. Then there is the notion of the head of the Windsor household paying a formal visit to the former colony in the Twenty-Six Counties. There are those who argue that the English monarchy is simply a quaint remnant of a by-gone era and its current incumbents should be allowed to get on with what they do, which is next to nothing of a useful nature. In a way they are undoubtedly right. The business people, politicians, generals and spooks are the ones that have the real decision making powers in the modern British state. But the English monarchy and its values are reflective of the sickness at the heart of the British state. It is elitist, archaic, anti-democratic, racist, institutionally sectarian and illegitimate in its very construct. During last week’s travelling insult to Irish democracy, one radio reporter talked at length about the work of Elizabeth Windsor’s own private fashion designer. Who pays for this fashion designer? Anyone who has the misfortune to have to pay taxes to the British government. On the other hand, anyone who watches the news, reads the papers or listens to the radio will probably recall cases of people receiving custodial sentences for shoplifting from clothes stores. This is the purpose of the English monarchy - to act as a figurehead for gross inequality, ill-gotten gain and, in the case of Ireland, a denial of sovereignty.